The experience of sailing sports is available to anyone in the Viharsarok Sailing Centre. The Sailing Centre has been operating since 2010, and it's located midway between the Szántód ferry harbor and the Balatonföldvár harbor. 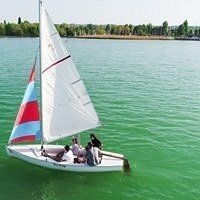 At Balatonföldvár's Eastern Beach the sailing center offers individualized services all the way from beginner to advanced levels. They're waiting with a team of skilled instructors to relax or recharge. Children could start surfing courses and camps from the age of eight. For more information visit their Facebook page!